He entered the room like a Don Juan; cool, calm, collected. Two hundred eyeballs fixed on his every move as he stepped up onto the table. He lay down as though he owned the room. 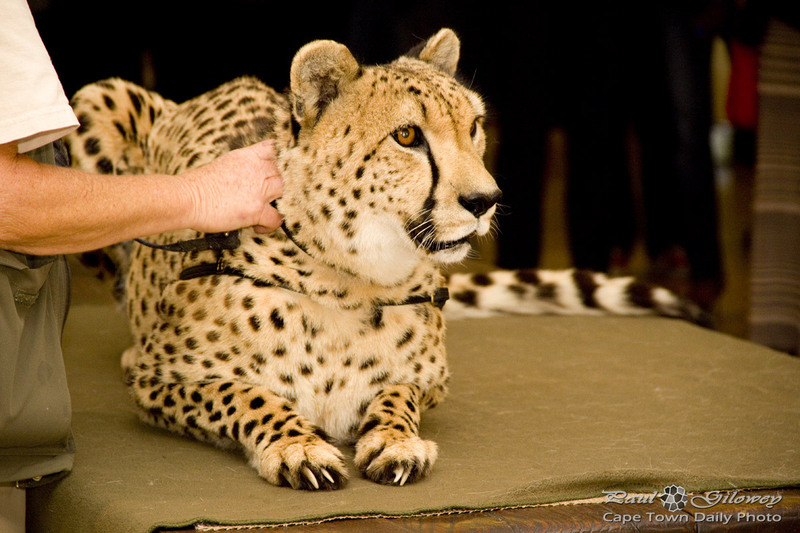 Joseph is a 10-year-old male cheetah who lives at Cheetah Outreach in Somerset West. Cheetah Outreach is a local conservation and education organisation that serves to save Cheetahs in the wild by educating the public. Wild cheetahs are often killed by farmers who are forced to protect their livestock from these predators. Most of the funds raised go towards their Anatolian Shepherd Guard Dog programme which places the dogs on farms to ward off cheetahs, and in so doing dissuade farmers from hunting the cats. If you'd like to get involved, or support Cheetah Outreach in some way, visit their website for a list of ways in which you can help. Posted in General and tagged animals, cheetah on Sunday, 4 November, 2012 by Paul. I didn’t realise they’d moved to Somerset West. I thought they were still at Spier. I saw them at Spier too… in April this year. They’ve unfortunately moved from Spier Jenna.